The Eden Project is one of Cornwall’s main tourist attractions. It is basically an enormous botanic garden housed in two conservatories (or Biomes) which play home to over 100,000 plants. It was built with help from lottery money in a former quarry in the Cornish wilderness, and is run as a charity. 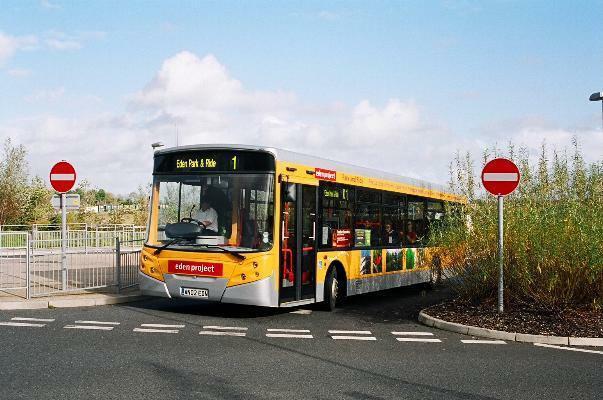 The site is connected to the nearest main line station at St. Austell by a bus service operated by local operator Truronian. They also provide the internal park-and-ride service using new Transbus Enviro 300’s. Click to enlarge photos. All photos taken in November 2003. Truronian Y2EDN at St. Austell rail station. Truronian AN02EDN, a Transbus Enviro 300, providing the internal park and ride at Eden Project. The biomes at Eden Project.